As my year as President draws to a close, a small amount of retrospection is appropriate. It’s been an educational year, usually interesting, sometimes aggravating, but never dull nor boring. I appreciate the opportunity to serve, and am especially grateful for the chance to work with some truly generous people who give freely of their time, talent, and financial support to make our club and community better. I won’t name names, because not only would I omit someone, but also because none of them seem to do what they do in hopes of public recognition or adulation. June is the first month of summer. The days are long and warm, and it’s a good time to visit historic sites, or just to read a good book. Our semimonthly Board meeting will be held on Tuesday, June 5, at Bearden Public Library. Meetings are always open to Roundtable members, but due to a long agenda, this month we’ll begin at 5 pm instead of the usual 6 pm. This will be the farewell meeting for John Stegner, who filled two offices this year, and Laura Reagan, who has been on the Board for the past 18 years. Joining the Board on July 1 will be Melanie Goldstine, Sheila Burchfield, and Tim Vane. Some current Board members will assume new duties, and Jack Spiceland will serve as our next President. I look forward to this coming year of excellent leadership from Jack and your Board. many years and will be sorely missed. He was a great man and a great friend. It’s been almost a century since this poem was written, but there is truth in the poet’s assertion. April can be warm….or cold. Flowers can bloom, then be covered with snow. Trees can bud, then be nipped by a sudden frost. Brian McKnight, who presented our program on March 13, noted that April 1865 was a mixed blessing for soldiers. True, almost all organized warfare ceased, so the risk of dying in uniform significantly decreased. The soldiers wanted to go home, and immediately at that. But many had hundreds of miles to travel, and especially in the South buildings had been destroyed and infrastructure, such as it was to start with, wrecked. So they walked. But then there were no seeds or draft animals, and it was past planting season. This guaranteed hunger if not starvation in the winter to come. As students of the Civil War and members of the Knoxville Civil War Roundtable, April has special interest for us. The general public accepts the month as the beginning and end of the conflict, Fort Sumter and Appomattox. The deadline for applications for the annual Dot Kelly Preservation Award is April 2. On April 7 Roundtable members will participate in our annual Spring Clean-Up at Fort Dickerson. A slate of officers who have generously volunteered to serve our club next year will be officially announced at the April 10 meeting. Ken Burns, whose 1990 documentary movie The Civil War rekindled America’s interest in this watershed period of history, will speak at The Tennessee Theatre on April 17. And at 2 pm on April 29, Dr. Joan Markel will lecture on “Soldiers and Civilians,” her final topic for this year, at McClung Museum on the University of Tennessee campus. Of course the centerpiece of April for the Roundtable is our monthly dinner meeting on April 10. Our special guest and speaker will be the inimitable Dr. James “Bud” Robertson, who is certainly one of the premier historians and lecturers of the Civil War. Also on April 10 we’ll celebrate the 35th Anniversary of the founding of our club, complete with cake, costumed living history interpreters, and other special events. Elsewhere in this newsletter are more details about these events, plus our continuing problem with dinner reservations. Please review them. Over a span of 43 years from August 1934 until November 1977, the newspaper cartoon character Li’l Abner periodically proclaimed “No man is an Ireland [sic].” That was true before Dogpatch and its denizens became famous, and it’s still true. Individuals and nations do not exist in a vacuum, and the actions they take—or don’t take—affect others, sometimes at a great remove in both time and place. Those who attended Kent Wright’s presentation on February 13 were reminded that the American Civil War had repercussions far beyond the shores of America. The sun never set on the British Empire. Great Britain was vitally interested in the causes and consequences of the American conflict. Gigantic forces which would shape the future of world history were at work. Wars are complex affairs. On March 13 we will welcome Gordon Rhea, whose topic will be “Cold Harbor”, one of the final battles of the Overland Campaign. It’s often overlooked, but the battle had significant effects. The war would continue for almost another year, and the casualty lists and financial and political costs would mount. This will be another interesting, educational evening. The Eighth Annual Civil War Lecture Series continues at McClung Museum at the University of Tennessee. On Sunday March 25 at 2 pm, Dr. Joan Markel will present “South of the River: Developments in Knoxville’s Historic Preservation Effort.” For 35 years our Roundtable has supported the preservation and historical interpretation of Fort Dickerson. Now Legacy Parks, the Aslan Foundation, the City of Knoxville, and other groups are increasingly adding to our efforts and saving land for public use and edification. This is a good opportunity to learn more about our history and its preservation. The Civil War Preservation Trust sponsors an annual Park Day. Volunteers clean up after winter and prepare Civil War sites for increased public visitation and usage during the warmer months. Director of Preservation Eric Wayland has scheduled a work day at Fort Dickerson for the morning of Saturday April 7. Mark your calendars, and join fellow Roundtable members for a few hours of making our community better. Also note that in April we’ll observe the 35th Anniversary of the Roundtable. Our speaker, Dr. Bud Robertson, will present his thoughts on a complex, provocative, and often controversial topic, and we’ll have a few special events to mark the occasion. Other important future dates include Living History Weekend at Fort Dickerson October 26-28, and a special Missionary Ridge Battlefield Tour on Saturday March 17. This field trip has been organized by members Neil Williams and Norman Shaw, and will be expertly led by Jim Ogden. Due to the government shutdown in January, the Stones River tour had to be cancelled, and will be rescheduled. At its regular meeting on February 6 the Board approved funding of up to $500 for the second Dot Kelly Preservation Award. Director of Community Activities Stan Sech and other Board members are aggressively publicizing the award and seeking applications. The grant will be announced at the Annual Meeting of the East Tennessee Historical Society in May. The Board continues to seek ways to improve the monthly meeting experience for our members and guests. Recently a random one-table-at-a-time numbering system has been used to ease congestion in the buffet line. Member feed-back has been overwhelmingly positive, so this system will be continued. 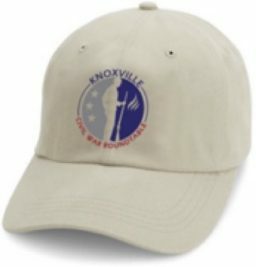 Finally, remember that the Roundtable is a volunteer organization. There are opportunities to benefit the club and the community at multiple levels of talent and time. Be a Volunteer! As I compose this epistle, snow is falling, and so is the thermometer, which is forecast to reach single digits within a few hours. These circumstances lead to increased contemplation on the vital role of logistics and economics in warfare. Several recent speakers at our monthly meetings have touched on the support required to keep an army in the field. In addition to feeding, clothing, sheltering, and arming the troops, the horses and mules required immense amounts of accouterments, fodder, and water. One of Jerry Patterson’s article reprints at the January meeting reviewed some impressive numbers for the animals. Of course, winter weather often magnified logistical difficulties due to cold, snow, mud, and agrarian unproductivity. Wood became fuel and shelter. The armies often needed more of everything, and got less of it. It all cost money, and lots of it. Winter must have been very unpleasant if not miserable for Civil War soldiers, and for civilians too. When I was a callow youth, a history professor startled my class by stating that all wars were based in economics. He went on to say that almost all armed conflicts had primary if not total economic causation, although higher-sounding excuses such as religion or culture were often advanced. Furthermore, economics generally determined the victor, especially if the conflict was prolonged. I’m sure there are exceptions to his rule, but the area is worthy of much more study and attention than it usually receives. Join us on February 13 as Kent Wright explores the complex web of cotton, economics, and politics both domestic and international in the 1860s. This is an unusual but timely topic and should be of great interest to all. The 108 who attended Michael Shaffer’s presentation on January 9 heard new perspectives on Civil War maneuver and fixed fortifications. 71 members enjoyed dinner together and were joined by an additional 31 members for the lecture. We also welcomed 3 non-members for dinner and an additional 3 for the program. Our August 8 monthly meeting was well-attended by 63 diners (55 members and 8 guests), and 36 members plus 3 non-members came for the lecture. So 102 persons listened and learned as Greg Biggs discoursed on the impressive logistics of Sherman’s Atlanta and To-The-Sea campaigns. Did you know that each horse required at least 20 pounds of fodder per day, and there were several thousand horses in the army? Or that a Union soldier could march only about 50 miles before his shoes wore out? Or that Union trains traveled in a loop from Nashville to Chattanooga to Bridgeport to Nashville so that no use of sidings was required? On September 12 Dave Mowery will discuss John Hunt Morgan’s raid across the Ohio River. Morgan had lots of men and animals—and no railroad or secure logistical tail. Come and hear how these obstacles were addressed. Although most of our members elect to receive the monthly newsletter electronically, hard copies are still mailed to museums, libraries, and a few members. Our Secretary Steve Dean has found a company that will do this for us, and at less cost than we have been paying. Dinner now begins at 6:30 pm, business at 7:15 pm, and program at 7:30 pm. Thank you to everyone who attended the March meeting to hear Curt Fields speak on “Appomattox: The Days before the Surrender”. His appearance and presentation as General Grant was commanding as well as enlightening. Total attendance for the lecture was an even 100. There were sixty-three diners, nine who were non-members. Also attending were an additional thirty-seven members and six who were non-members to hear the presentation. Thank you once again for your support and interest in the Round Table as this is the best attended event of the year. Remember to make your dinner reservation by 11 a.m. Monday April 10th to hear Scientist, Attorney, Historian and Author Scott Mingus speak on “Extra Billy Smith”. I’m looking forward to seeing all of you at the April meeting. Looking forward to the May 9th dinner meeting, please mark your calendar to hear Bud Robertson’s presentation on “The Four-Legged Soldier”. You will not want to miss Mr. Robertson, who is an outstanding speaker, historian and author. It is 4:30 pre-dawn in Charleston Harbor. The date is April 12, 1861 and a single mortar round is fired at a fort in the middle of the harbor. The shell explodes over Fort Sumter, a Federal Fort. The mortar round is fired by the Confederate States of America under the command of Brigadier General P.G.T. Beauregard. Major Robert Anderson is the commanding Federal officer of Sumter. The American Civil War has begun. 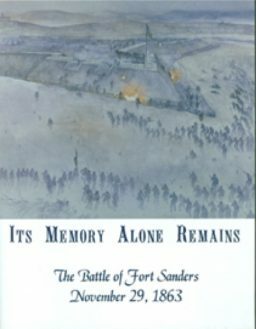 Surrounding the harbor, all of the Federal installations and Forts had been surrender to the Confederacy except for Sumter. Strategically and geographically Sumter can control all ships coming and leaving Charleston. The South for the past several months has been demanding that the fort be evacuated and surrendered. On the afternoon of April 11th, Beauregard sent a letter of ultimatum to Anderson demanding its evacuation. Anderson replied “I regret that my sense of honor, and my obligation to my Government, prevent my compliance”. Beauregard was informed by friends in Washington that an expedition was on route to Charleston to relieve Anderson and a force would be landed to overcome all opposition. On the eve of the 11th, masts of the Federal ships could be observed forming off shore. Anderson sent word to Beauregard that he would evacuate the fort on April 15th. With the expedition force offshore, Beauregard could not wait. At 3:20 a.m. on Friday, April 12th, he sent word to Anderson that he would open fire within one hour. By 5:00 a.m. gun batteries from Fort Johnson on James Island, Morris Island, Mount Pleasant, and Sullivan Island were firing on Fort Sumter. 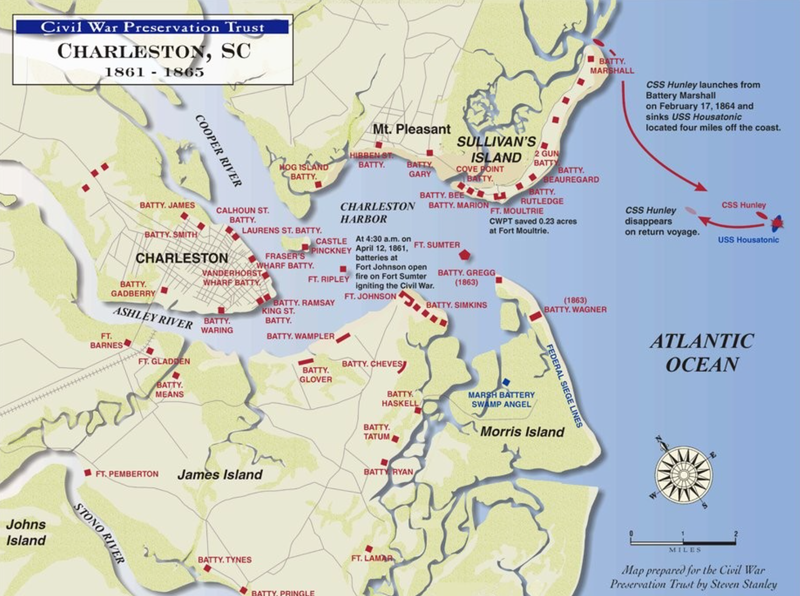 In Charleston, Mary Chestnut, the wife of Colonel James Chestnut, was awaken suddenly by the bombardment. She wrote, “I sprang out of my bed, and on my knees prostrate, I prayed as never before”. Spectators circled the harbor to watch the shelling of the fort. Concussions of the shells hitting the walls of Fort Sumter could be felt in downtown Charleston and the sound of the guns could be heard more than forty miles away. It most certainly must have been a spectacular site. The assault on Fort Sumter ended with Colonel Anderson’s surrender at 2:30 p.m. on April 13th. The bombardment lasted for 34 hours with more than 70 Confederate guns and over 4000 shells fired. Although the fort had suffered considerable damage, no one lost their life. The firing on the fort united a formerly divided North behind President Lincoln’s mission to preserve the Union. On April 15th Lincoln proclaimed a state of insurrection rather than war and issued a call for 75,000 volunteers to quell the rebellion. Officially, the Civil war has begun. Thank you to everyone who attended the February meeting to hear Professor Earl Hess speak on “Civil War Tactics”. Total attendance for the lecture was seventy-nine. There were forty-five diners, five who were non-members. Also attending were an additional twenty-four members and four who were non-members to hear the presentation. Thank you once again for your support and interest in the Round Table. Remember to make your dinner reservation by 11 a.m. Monday March 13th to hear historian Curt Fields speak on “Appomattox: The Days before the Surrender”. I’m looking forward to seeing all of you at the March meeting. I found this book at the back of my book case and thought it would be interesting to look at the war from a lighter point of view. It is written for high school level readers and presents many facts and stories in an easy to read format. Here are a few short snippets taken from the book that I found interesting. The Rebel Yell: Historians believe the rebel yell was first heard at the First Battle of Bull Run in July 1861. After nearly 14 hours of fighting, a corps of soldiers under Pierre G. T. Beauregard began a counterattack against Union forces and launched the now-famous wail. When the Union forces saw – and heard – what was coming at them, they panicked and fled in retreat. The rebel yell was heard during every major battle after that. Substitutes: Future Presidents Chester A. Arthur and Grover Cleveland, both of draft age, avoided military duty by paying others to serve for them. Spencer Rifle: Union ordnance men turned down the Spencer repeating breech loading rifle in 1860 with the explanation that soldiers would fire too quickly and waste ammunition. Smarter minds prevailed, and the Spencer eventually made its way to the battlefield, but not until near the end of the war. 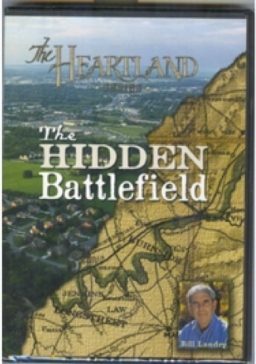 The Homes of Wilmer McLean: Wilmer McLean witnessed firsthand both the beginning and the end of the Civil War. McLean’s family estate was located near Manassas, Virginia, directly in the path of the Battle of Bull Run. McLean was so shaken by the incident that he decided to move as far away from the war as possible, settling his family in Appomattox, a quiet town southwest of Richmond. The McLeans lived in relative peace for almost the entire war, only to find the conflict knocking on their door once again on April 9, 1865. McLean was asked about possible locations in which Lee could meet with Grant to discuss surrender terms. McLean reluctantly offered his own home.  Astoundingly, only one civilian (a young woman who was struck by a stray bullet) was killed during the three-day battle at Gettysburg.  During the Battle of the Wilderness, fighting was halted on several occasions as both sides tried to rescue wounded comrades from the uncontrolled brushfires that threatened to burn them alive.  The first federal income tax law was enacted during the Civil War but died after the war was over. It wasn’t until 1913 and the ratification of the Sixteenth Amendment that the income tax became part of the U.S. Constitution.  Weapons fire on both sides was often wildly inaccurate, due to the limitations of the weapons and the hurried panic of the men who used them. As a result, some soldiers estimated that it took a man’s weight in  lead to kill a single enemy in battle. According to a Union munitions expert, each Confederate who was shot on the battlefield required 140 pounds of powder and 900 pounds of lead.  Confederate General Thomas “Stonewall” Jackson drew his sword so infrequently that it actually rusted in its scabbard.  The Civil War soldier was paid very little for laying his life on the line. Top pay for a Union infantry private was just $16 a month. His Confederate counterpart received $18 a month, but it was worth considerably less due to skyrocketing inflation.  At its height, the Confederate POW camp near Andersonville, Georgia, contained more than 33,000 Union prisoners, making it the fifth largest city in the Confederacy.  Lieutenant David H. Todd, commandant of the Confederate Libby Prison in Richmond, Virginia, was the half-brother of Mary Todd Lincoln.  Jefferson Davis’s plantation in Mississippi was turned into a home for freed slaves at the end of the war. In April, Eric Wittenberg, Attorney, Historian and Author, will present “Brandy Station” at the Round Table’s monthly meeting on April 11th, 2017. I’m looking forward to Mr. Wittenberg’s thoughts and insights concerning this topic. Thank you to everyone who attended the January meeting to hear Jim Lewis speak on “Hell’s Half Acre”. Total attendance for the lecture was 82. There were 51 diners, four who were non-members. Also attending were an additional 24 members and seven who were non-members to hear the presentation. Thank you once again for your outstanding support and interest in the Round Table. Remember to make your dinner reservation by 11 a.m. Monday February 13th to hear Earl Hess speak on “Civil War Tactics.” I’m looking forward to seeing all of you at the February meeting. Since February 12th is Abraham Lincoln’s birthday, I decided to write my column on what he believed to be his most important achievement – The Emancipation Proclamation. With the discussion of Presidential Executive Orders in today’s news, I thought it would be interesting to review Lincoln’s Emancipation Proclamation. Here are some of my thoughts on the Proclamation. The first draft was presented to Lincoln’s Cabinet on July 22, 1862. The issuing of this draft was delayed at the advice of Secretary of State Seward until the Union had a significant military victory. A Preliminary Proclamation was issued September 22, 1862 after the Union victory at Antietam. A 3rd draft was written between December 29-31, 1862 and the Proclamation was issued and became law on January 1, 1863. Lincoln signed the Proclamation on that day against the advice of most of his Cabinet. Was it a legal document? The Constitution in 1863 did not allow Lincoln via executive order to free slaves in Union states. Slavery was legal in the US Constitution. Through the War Powers clause of the Constitution Lincoln, as Commander-in-Chief, was able to claim presidential authority to free slaves in the states in rebellion. States who remained part of the Union with slaves were not affected. These states were Missouri, Kentucky, Maryland, Delaware and the state to become West Virginia. The Proclamation was a temporary document and it would need Congress to pass the Thirteenth Amendment to the Constitution to enact into law. Lincoln was looking for the Proclamation to have an impact militarily, politically and morally. Militarily, he hoped that slaves would come forward and join the Union army as well as leave the plantations in the South reducing its labor force choking it economically. Politically, it would make it more difficult for England and France to support the Confederacy. Morally, the scourge of slavery could be ended and the process to free all slaves would be in place if the North won the war. Hindsight tells us that all of this was accomplished but whether the Proclamation did this is debatable. Author Richard Hofstadter is quoted that the Proclamation “had all the moral grandeur of a bill of lading”. “If my name ever goes into history… it will be for this act [the Emancipation Proclamation]”, President Abraham Lincoln. Lincoln wrote every word of the Emancipation Proclamation with little or no consultation. It was written in the manner to meet legal requirements and as such not very inspiring. Having said that, the Proclamation was the first written document promising to end slavery. One final tidbit. In reading and re-reading the Emancipation Proclamation and the section that speaks to the States in rebellion, Tennessee is left off the list. I have listed a couple of books in my sources if you would like to read more on this topic. In March, Curt Fields, Historian, “Appomattox: The Days before the Surrender” will be the presenter at the Round Table’s monthly meeting March 14th, 2017, on this topic. The Greatest Speech, Ever – James L. Cotton Jr.